In addition to being a Readers' Favorite 2015 Book Award Finalist, this novel was also honored as Kindle Book Award Finalist, a Gotham Writers' YA Novel Discovery Contest finalist, and an IndieBRAG medallion honoree. Turning 15 has never been a more stressful experience. Brigid, a 15-year-old, has just found out that she's the most recent in an ancient Celtic tribe. Instead of being a princess, or a famous artist, Brigid is the direct inheritor of magical powers of her ancestors. When something dark and deadly from their past threatens her, Brigid must learn to look deeper into herself than she ever imagined in order to save herself and her family. Circle of Nine: Beltany is a wonderful fantasy/contemporary blend from Valerie Biel! This was a truly beautiful read. I enjoyed myself immensely during the entire ride and Circle of Nine: Beltany is sure to be sticking in my mind for weeks and months to come. I've already caught myself reminiscing during the quieter moments of work twice! Brigid starts off as your typical teenager. She's anxious about her birthday and popularity and all that jazz, and her world gets rocked when she finds out about her heritage. This is a true coming of age novel, exploring both Brigid as a young girl, and how she relates to her family and history. Valerie Biel has a captivating, almost lyrical quality to her work that helps the flow and the smoothness of the piece wonderfully. You can just feel the words slide along as you read and it's a remarkable experience. I enjoyed her storytelling as much as I enjoyed the characters and the plot! 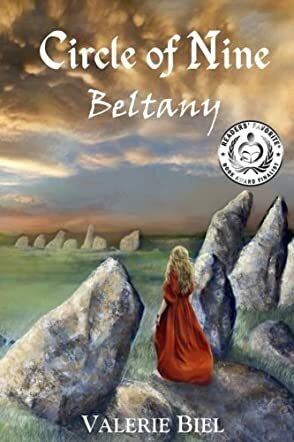 Circle of Nine: Beltany is a wonderful blend of present and past, mixed with a healthy dose of Celtic mythology to captivate the brainiacs among us.